Autumn Harvest Salad is the perfect easy side dish or lunch for Fall. 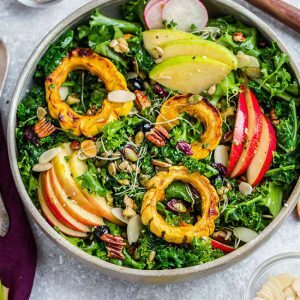 Made with roasted delicata squash, kale, crispy apples, pears, cranberries and crunchy pecans. Gluten free, refined sugar free with paleo, low carb, keto & Whole 30 options. Fall is in the air and this Autumn Harvest Salad has been happening on repeat at our house. It’s packed with tons of healthy greens and hearty flavors of the season. 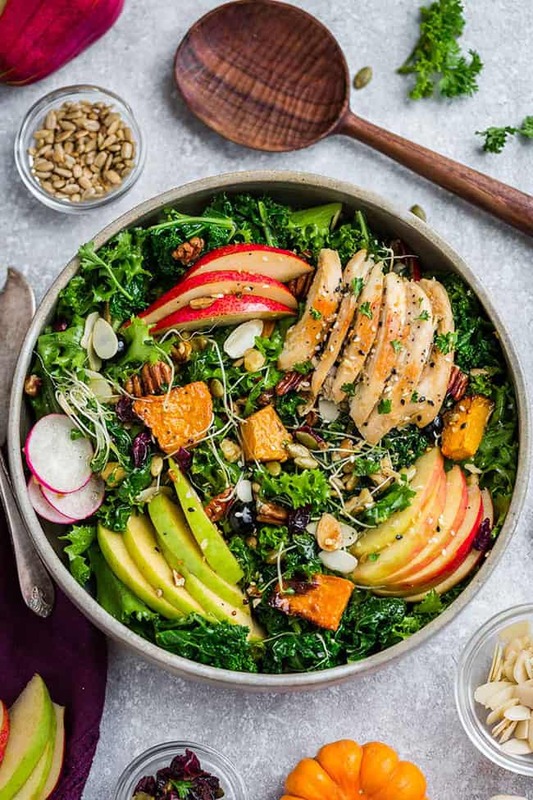 We are big salad fans and one of the best things about having a salad for lunch or dinner is that you can pretty much customize it with whatever you have on hand. 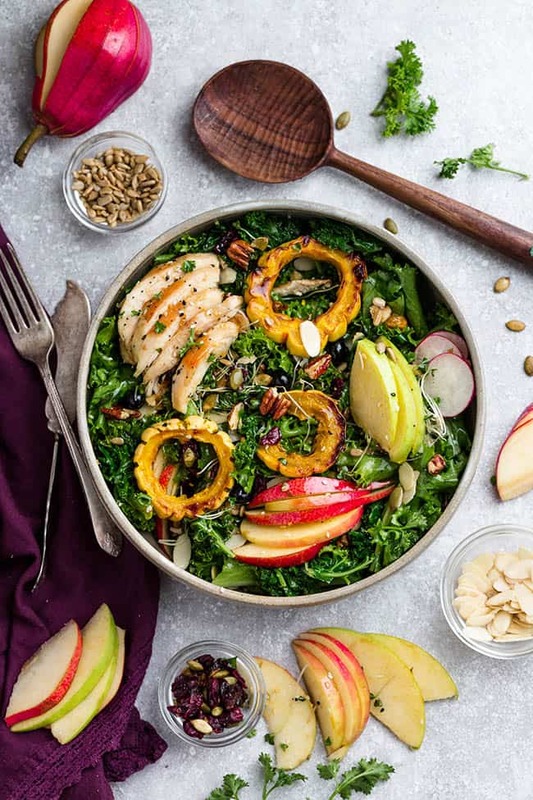 This Autumn Harvest Salad is packed with roasted delicata squash, crispy apples, pears, kale and crunchy pecans. Not a fan of delicata squash? Swap it for butternut, acorn, sweet potato or pumpkin instead. Don’t like chicken? Leave it out or use turkey instead. Watching your carbs or want a keto version? Leave out the apples, pears and use cherry tomatoes or a few slices of figs. WHAT INGREDIENTS ARE IN A AUTUMN HARVEST SALAD? For a paleo and Whole 30 compliant version, simply leave out the dried cranberries. My kids are actually big kale fans and will eat raw kale straight from the garden. But what if you’re not a big kale lover? Is kale good in a salad? I happen to think kale is perfect and makes a delicious vessel for a salad since it keeps well in the refrigerator for a few days. That means you can wash and prep it ahead of time on your Sunday or Monday meal prep day. Kale has lots of fiber which is one of its great health benefits. But when preparing kale for salads, you should tear or cut into thin little pieces. Massage the kale leaves for about 2-3 minutes with a little bit of your salad dressing. This helps to break down the plants fibrous cells. Although it’s an extra step – massaging the kale makes a big difference and is key when making delicious kale salads! Roast the vegetables: Start off by cutting the delicata squash into rings and roasting in the oven (or air fryer if you have one for 15-25 minutes) at 400F for about 15-22 minutes, or until squash is tender. For the chicken, I used leftover rotisserie chicken to keep things simple. But you can also grill or roast your own chicken if you prefer. Make the dressing: While the pumpkin is roasting, make the vinaigrette. Combine avocado oil, apple cider vinegar, orange juice (or lemon juice), Dijon mustard, thyme, salt and black pepper. Feel free to add sweetener of choice depending on what diet you are following. For a paleo friendly sweetener – add maple syrup or raw honey. For low carb / keto – use about 2 drops of liquid monk fruit or stevia. Leave out for whole 30. Wash and prep the greens. For the kale, tear the leaves off of the ribs. Add the kale to a large bowl along with 1 tablespoon of dressing. Massage the leaves for 2-3 minutes until the leaves have softened. Add chopped endive and another tablespoon of dressing and toss to combine. Allow to sit while you prepare the other ingredients. 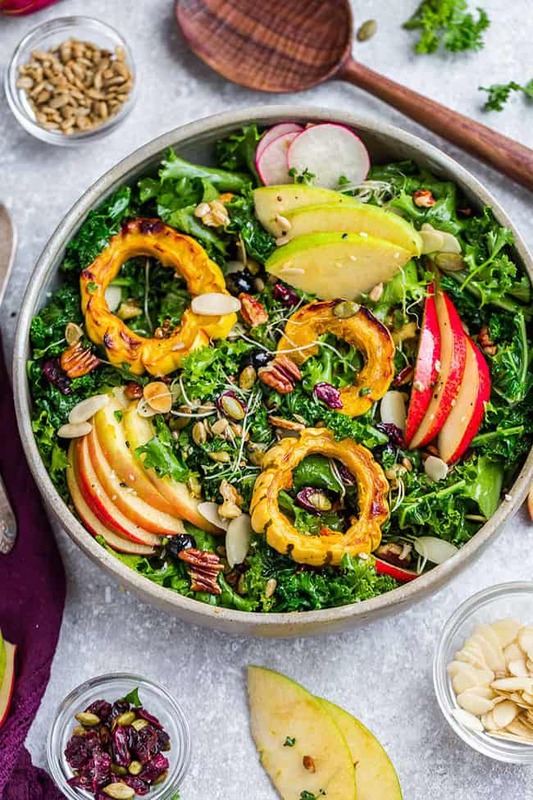 Assemble the salad: Slice or chop the apples and pears and layer on top of the kale. Once your roasted pumpkin is done, add to the salad. Place the sliced chicken on top (or leave out for a vegetarian / vegan version). Sprinkle with pecans, blueberries, pumpkin seeds, sunflower seeds and slivered almonds. Drizzle the remaining dressing over the salad. Toss before serving. WHAT OTHER INGREDIENTS CAN I USE IN THIS AUTUMN HARVEST SALAD? The great thing about this kale salad is how versatile it is. Not a fan of delicata squash? You can easily leave it out or make a harvest salad with butternut squash, sweet potatoes or even pumpkin instead. I’m allergic to nuts – can I leave out the pecans and almonds? Absolutely! Leave out both for a nut free autumn harvest salad. Can I make this salad vegetarian if I leave out the chicken? Of course! We served this autumn chicken salad as an all-in-one complete meal since my husband is a big meat eater. But you are more than welcome to enjoy this without any extra protein and serve as a side instead. Our apple harvest salad is fairly quick and easy to make. 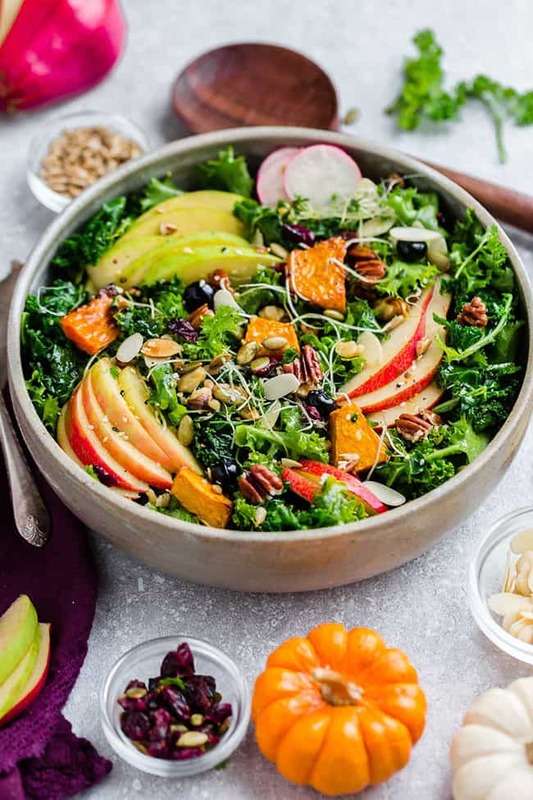 Best part of all, this delicious kale salad makes a healthy lunch or dinner on the table and can be ready on the dinner table in about 30 minutes. Salads are perfect for using up any extra leftover roasted vegetables from the farmer’s market. Pair your salad with any protein you have on hand. Not a fan of chicken in your autumn harvest salad? Leave out the chicken for a meatless version or you can add some turkey or even salmon instead. Autumn Harvest Salad is the perfect easy side dish or lunch for Fall. 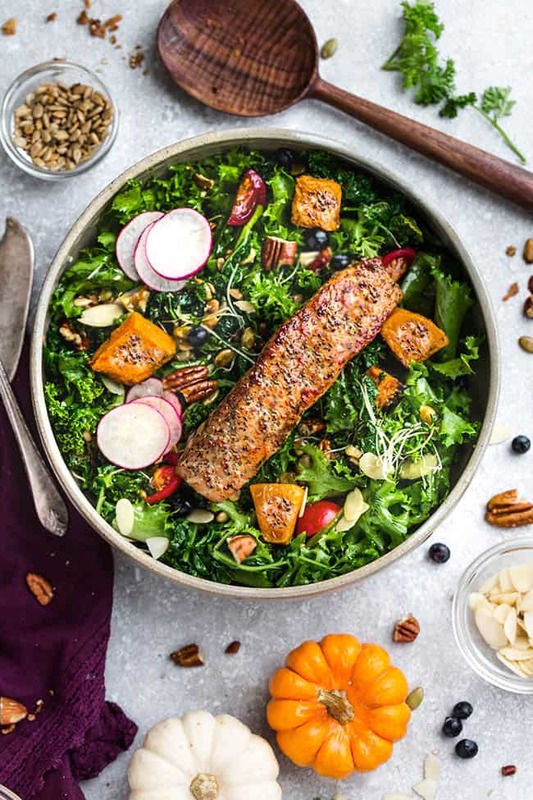 Made with roasted delicata squash, kale, crispy apples, pears, cranberries and crunchy pecans. Preheat oven to 400 F. Spread squash on a parchment lined baking sheet in a single layer. Drizzle with 1 teaspoon olive oil and 1/4 teaspoon salt. Roast for 25-35 minutes until tender. (If you have an air fryer - you can also air fry for 15-20 minutest at 400F). Let cool. Meanwhile, make the vinaigrette by adding avocado oil, apple cider vinegar, orange juice (or lemon juice), Dijon mustard, thyme, salt and black pepper in a mason jar or bowl and shake or whisk to combine. Add sweetener of choice depending on what diet you are following. For a paleo friendly sweetener, use maple syrup and for low carb / keto - you can use 1-2 drops of liquid monk fruit or stevia. Add kale and 1 tablespoon of vinaigrette to a large bowl. Massage leaves for 2-3 minutes, until leaves have softened. Add endive and another 1 tablespoon of dressing and toss to combine. Allow to sit while you prepare the other ingredients. Slice or chop the apples and pears and layer on top of the kale. 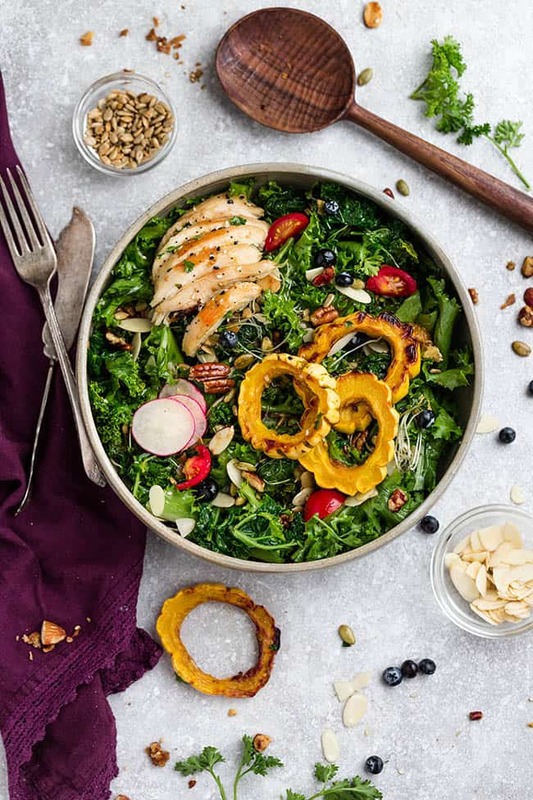 Once your roasted squash is done, add a few rings to your salad and top with chicken (or leave out for a vegetarian / vegan version), sprinkle some pecans, blueberries, pumpkin seeds, sunflower seeds and slivered almonds. Thank you! Check your email for a confirmation link. Add l[email protected] to your email contacts so that you don't miss it. Once you confirm, you'll receive a link to download the printable!